Thailand has lifted its four-month ban on YouTube after YouTube implemented a program to block access through Thai Internet Service Providers to video clips that violate Thai law or are "deemed offensive." How would they define "deemed offensive"? I don't know. Aw Zar Thi has a very interesting website, full of well-written commentries on Burma and Thailand. I have to say it's a good read. Federal transportation officials are traveling to the Twin Cities Thursday to begin investigating the deadly collapse of an interstate bridge into the Mississippi River in Minnesota. A former professor of Burmese at the University of London died at his home in Moulmein in Mon State on July 31. During his days in London, Hla Pe worked on a Burmese-English language dictionary with other leading scholars---J A Stewart, C W Dunn, J S Furnivall, G H Luce, Charles Duroiselle, Anna Allott, John Okell and the Americans R. Halliday and A C Hanna. The project started in 1925 under the aegis of the Burma Research Society, and was continued at Rangoon University and later SOAS. As old professors are dead and dying, the future of Burmese literature remains bleak. Tight censorship and not having freedom to think have killed the creativity of many young people in Burma. For example, Burma Research Society does not even exist now while Siam Society in Thailand thrives on. Salute to the fallen heroes and those who dare for Burma! Some novels about Burma I have recently read are Amitav Gosh's The Glass Palace, Amy Tan's Saving Fish from Drowning and Daniel Mason's The Piano Tuner. I have been reading Amy Tan's "Saving Fish from Drowning." The sad news of famous Burmese actor "Dwe", who died yesterday, was not picked up by an established news media, rather by a blogger. The blog entry came up online the same day within a few hours of the incident. May Dar Wii has been posting regularly with an irregular internet access from Burma. 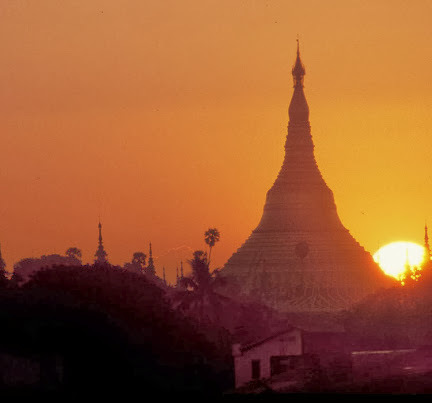 Her blog gives the readers firsthand descriptions of life in Burma. 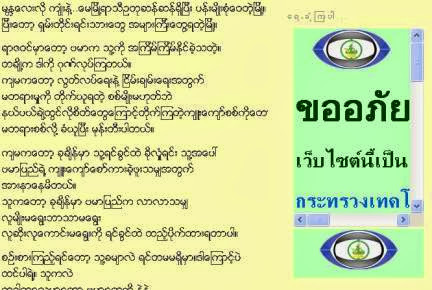 I am sure the future of Burmese news media will move to the Internet, which is a good thing because it's much harder to censor online contents. Let's look towards the future. Even the Chinese hasn't successfuly been filtering all of the so-called "unhealthy-for-citizens" information. The arms race between censorship and anti-censorship measures have already begun in Burma. I am sure anti-censorship endeavors will not fail. The Internet and blogosphere has become a place to write contemporary history, which otherwise would have been forgotten because of censorship in printed media. I hope someone will write about 7th July in Wikipedia. 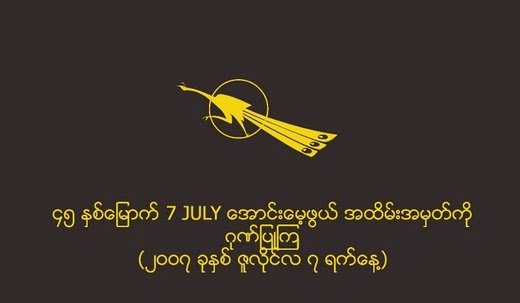 Here is an article about 7th July in Burmese by Myint Zay. YANGON: One woman was killed, seven injured and hundreds left homeless after a freak tornado ripped through Yangon, police said Friday. New rules being considered by the Mayor's Office of Film, Theater and Broadcasting would require any group of two or more people who want to use a camera in a single public location for more than a half hour to get a city permit and insurance. Thieves in the former Burma's main city, Yangon, are taking advantage of outages often lasting for more than 20 hours a day to steal the copper power cables, police said on Friday. I was driving on Pennsylvania Avenue when the sound of siren wailed behind me. I pulled over to the side and let them pass. I moved on within a few minutes after a few official cars passed me. I was on a crowded bus on the way back to Insein from downtown. Long lines of cars were waiting for the green light because one important government official was supposed to pass across the Hledan junction. All of us were waiting for about half an hour in the crowded bus. I haven't been writing anything lately. However, I am reading some interesting Burmese blogs. Khin Min Zaw's blog touched me. Very interesting experiences of the blogger. I have been following Sayama May Nyane's blog recently. Sayama May Nyein (Nyane) is a well-known Burmese writer and a former Burmese literature lecturer at Rangoon University. She is currently living in exile. I have noticed that Internet censorship is getting worse in Thailand. Here is the screen shot of the chat box being blocked by Thailand ISP. The chat box is being used by several bloggers hosted on blogspot.com. Note: www.youtube.com is still banned in Thailand. When I looked at the visitor logs for my site, I found a visitor from NBC Universal in North Hollywood, searching for images of "Burma Village" through google images. Burma is interesting indeed. I haven't been able to write anything lately. I am really depressed. I hope to overcome this but I am not sure how. About a dozen Burmese activists staged a demonstration in downtown Rangoon on Thursday, calling on the government to do something to correct the country's economic and social crisis and eliminate corruption. Onlookers joined in the protest. Riot police stepped in and arrested at least two people. I haven't been able to update my blog for a long time. The web site was down for many weeks because Friends of Burma in the US forgot to renew the domain name. Now the site is back up. I have been busy with school and work and I am a bit depressed, too. A British journalist, Evan Williams, sneaked into Burma as a tourist and made this documentary about Burma. It was broadcast on channel 4 in the UK on October 2, 2006. Today is Independence Day in Burma. Burma has been independent for 59 years now. Instead of developing forward, its direction of development is backwards. I hope the best for our country in the future.